Specialised team in Hotels, night clubs, pubs, gaming rooms, restaurants and more. We cover a wide variety of industrial installations all over QLD. We can do so much you will have to see yourself. Rampage Electrical works on all types of housing including working with builders and doing private jobs... no job is too big or too small. We have experienced and knowledgeable data technicians who cover an extremely wide variety of data installations including CCTV. Our team is experienced in VoIP phones, adsl/broadband installations, switch gear, phone lines, data points, domestic data & phone set ups including multi broadband points. We also install large security systems for motels, apartment blocks, hotels, offices and factories. We specialise in CCTV and surveillance systems and have expert technicians monitoring and repairing systems throughout Queensland. We install smaller more basic systems for the home and small businesses. 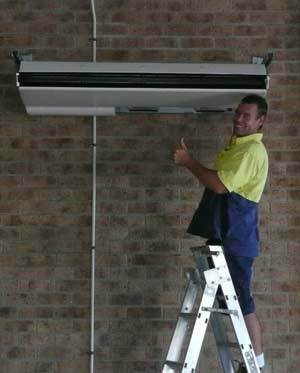 We also install larger systems for commercial and industrial premises. We use both Linux based and P.C based dvr’s depending on what is required. We offer a different system for every installation, to meet the type and quality or recorded images that are needed. We can increase storage capacity in the systems we use depending on how much recorded footage is required. We can take the level of recording up to the highest available quality which at the moment is DVD quality or siff 4 .We can install remote access systems that will run from your lap top operating world wide as long as you have the internet you can watch what is going on at your home or place of business, links to mobile phones to alert you when a sensor or alarm goes off is also possible. We supply and install various types of air-conditioning to homes, offices, shops, hotels, apartments and all other areas cool air is needed. We size up and only install the correct size and type of unit for each particular installation. Reverse cycle inverter systems are easily installed and wired to the highest standard at all times. Rampage Electrical Services specialises in a wide variety of electrical jobs, from changing power points to building 22 thousand volt substations. Our team is trained in all aspects of electrical work .We have CCTV tech's, data tech's, airconditioning installers and highly skilled main stream electricians. All our staff are friendly and keen to please ,we pride our selves on quality and can look after any of your electrical needs. If you are looking for prompt, reliable and friendly service call us today for your free quote.